Join the discussion on our forums! Come discuss Thistle Tea over in our dedicated Thistle Tea discussion topic. Draw a card. Add 2 extra copies of it to your hand. Aren't Thistles prickly? Why would you drink them? I don't get Rogues. I can't believe how long it took for me to notice this card was a godsend for Mill Rouge decks. The golden version is really detailed. The hearthstone wiki explicitly states that mines and ambushes aren't copied. So draw with reckless abandon! They ARE copied. The first will trigger, the second and third end up as 0-cost spells in your hand instead. In other words, combo activators! Got the gold version, played it, drew Burgle, burgled 6 gold cards from a Mage. It was amazing. you still have the deck? This is my favorite golden art from the expansion, maybe ever! You're British, I take it? If it would read ''draw a minion, add two copies of it to your hand'' would it be like unbalanced then or? Fatigue doesnt matter in a Cthun meta and most Rogue cards have strongly diminishing returns on having multiple copies. 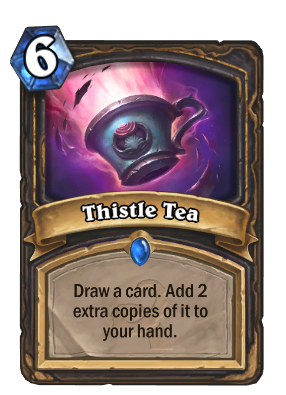 Doing Prep Thistle Tea on turn 3/4/5 and getting Cthun will probably lose you the game unless you are playing against a really bad deck. I remember when rogues in WoW was using this to gain some more energy during fights. I really liked that tea. I remember the the quest to get the recipe in the Barrens.